every morning, mommy or daddy feeds the outdoor animals like the birdies and the beaver squirrels. we call them “beaver squirrels” because when aunt patty and her boyfriend chris were here to visit, aunt patty said that the squirrels were as big as beavers. of course, us furry bambinos like to help mommy or daddy when they throw the food outside. we snoopervise and we perform qa checks of the peanuts and sunflower seeds. we also like to sniff the outside air. it smells different than the inside air. in the winter time, the outside air is very cold. 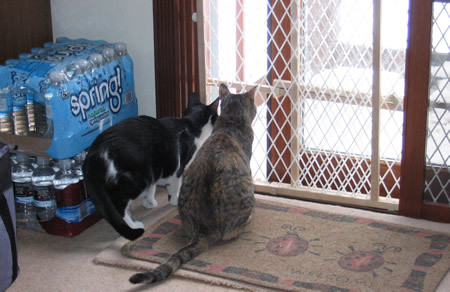 for some reason, mommy and daddy always put this gate thingy in front of the door when they feed the birdies. but the outside air smells exciting! one of these days, i’m gonna explore out there. for some reason, mommy and daddy always grab me and haul me back inside, just when i’m on the verge of escape! have a happy easter efurryone! 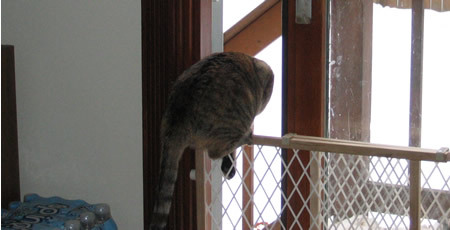 Filed by Meerkat on Mar 21st, 2008 under Birdies, Explorations, Flight Risk, Meerkat's Posts, Snoopervising, Squirrels. Leave a Purr or Hiss. Oh, man! You were so close! Have a great weekend! Your message bottle is now afloat in the vast blogosphere ocean. You are Message In a Bottle #212. Happy Easter! I hope the Easter Bunny brings you lots of treats. 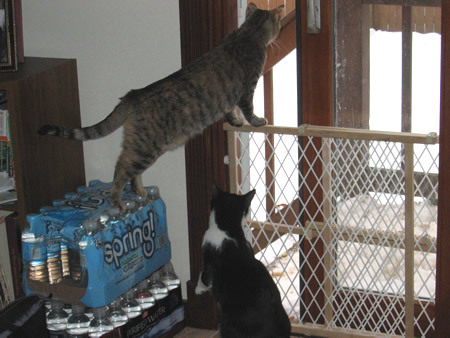 You two look like you are having tons of fun looking outside! Squirrels as big as beavers, Wow!